It seems no-one like wearing raincoats, not even the Queen. Yep! I feel that way when someone gives me a bunch of flowers as well. Was it the same person who drew spiders all over this dog who did flys all over the Queen’s dress? It seems yellow really can make everyone mellow. Even the Queen and that cute little dog. Anyone can look regal when they are wearing a crown. They both looks simply fabulous. But that dog’s cat necklace is much better than the Queens. 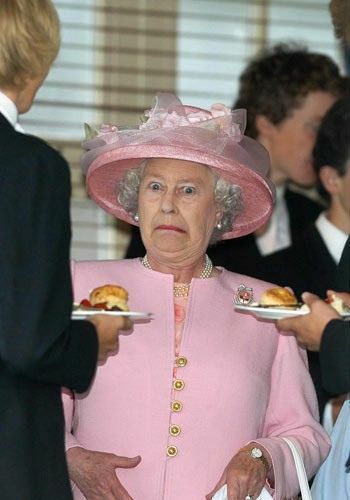 I’m not sure what sort of food they are offering the Queen, but it looks like she won’t be having any of it. That is the true face of disgust, on both the Queen and that very disgusted dog. Even the Queen likes to poke her tongue out now and again, sadly the dog always has his out due to the size of it! These two peeking around the corner looks like they are playing hide and seek! I wonder who is trying to find them?! ?